NADAP’s Pier Pressure mobile game leaves the decisions up to you. 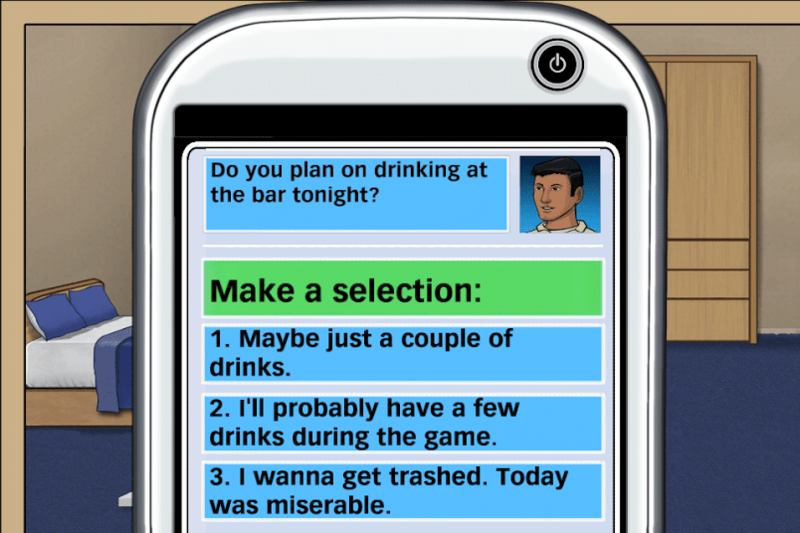 In an effort to reach young, impressionable sailors through their mobile phones, the Navy Alcohol and Drug Abuse Prevention Office has launched Pier Pressure, an iPhone/Android app that combines gaming and advice for making good choices when it comes to your time off. Think Angry Birds meets middle school D.A.R.E. class. On the gaming side, Pier Pressure starts you off by letting you select one of five characters, three female or two male, with customizable hair and eye colors, all ranked seaman apprentice. The day begins with a shift at the dock, loading ships in a certain amount of time before they head out. After work, you send a text to a friend and make plans for the night. Friend: Do you wanna grab some food? You: No, I think I’ll drink my calories tonight. You get a $100 budget when you go out, which is actually just a game of shufflepuck. (That’s a blend of bowling with a hockey puck on a table, for the uninitiated.) You can order food and drinks, but a cab ride is $45, and your score is affected if you don’t get a safe ride home. A leaderboard in the app lets you compare your scores against your friends. The tools section of the app include a blood alcohol level calculator, a cab company search based on your location, and multiple Navy resources. The idea for the app came directly from sailors, according to a release. Developed by contractor Booz Allen Hamilton, 110 sailors participated in testing the app. Pier Pressure is available for in the Apple and Google Play app stores. they should make the app use real sms’s and be able to send real sms’s and be able to use custom sms messages. rank them together and make a contest to have the most used response to the “lets rage” texts everyone gets. post a ranking on facebook or another site and see what the out come is whos is most used and selected from the game. be hilarious to see what people come up with to respond with thats positive. Would playing this at work be a good use of my time?